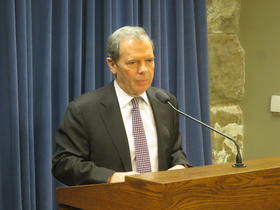 To that end Rauner presented lawmakers with a stark choice. Option A: Rauner wants the Democratic-controlled legislature to adopt his pro-business, anti-union plan, which calls for clamping down on collective bargaining, decreasing costs on companies when workers are injured and term limits on legislators; it's the same so-called "Turnaround Agenda" he's been pushing since he came into office. "We agree - together - on economic and governmental reforms, to accompany a negotiated balance of spending reductions and revenue, that ensures that Illinois can be both compassionate and competitive," Rauner said. If he gets his way, Rauner says he'll agree to tax hikes, though nowhere in the half hour speech did he get specific on just what kind of tax hike. "I won't support new revenue unless we have major structural reforms to grow more jobs and get more value for taxpayers. I'm insisting that we attack the root causes of our dismal economic performance," he said. But if Democrats won't agree to those so-called "structural reforms -- as they've refused to do so far -- then it's time for Option B, which Rauner phrased this way: "You give the executive branch the authority to cut spending to live within our revenues." Rauner's asking for is the authority to hack $3.5 billion dollars in government programs, carte blanche. Rauner says he prefers the first option -- the compromise, without the massive cuts -- and tried to convey a sense of urgency. "You choose. But please, choose now," he said. The governor included a sweetener. He'll says he's willing to leave part of his agenda on the table (though he didn't say which part). "To take this path, we don’t have to enact every item of our Turnaround Agenda in their current forms, but we must pass REAL reforms this year," he said. Democrats were quick to answer: None of the above. Option A is basically the same deal Rauner has been offering all along, prompting Senate President John Cullerton to say "to the extent that he had 50 radical things and now he's down to three radical things, I guess that's supposed to make me try to meet him in the middle. I don't think that's fair. There still are things which are not practical, and they're not going to pass. And they're not even good ideas." Legislators have previously given governors something akin to the power Rauner's asking for in his Option B, which House Speaker Michael Madigan described as "unilateral budget-making power." When asked by a reporter what makes it different this time, he responded "the person occupying the governor's office." That shows the depth of distrust among Illinois' leaders. That was also evident in the response to Rauner's push to increase education funding -- something that would normally be embraced by politicians from both parties. Instead, Rauner seems to have opened a new battlefront. Despite constantly complaining about Illinois growing deficit, the governor proposes sending an extra $1.25 billion to schools, without saying where the money would come from. And he wants it done regardless of what else happens in state government. "I restate my request – send me that appropriations bill right away – clean – no games – to give our schoolchildren, our parents, and our teachers the security of knowing that education is our top priority," he said. In doing so, Rauner's undercutting Democrats' efforts to steer more money away from wealthy districts to poor ones, and, critics say, allowing an unfair system to continue. Rauner is also effectively putting Democrats on the spot should they chose not to go along, leaving them to take the blame should the dysfunction in Springfield spread to every school in Illinois. The governor's speech comes exactly exactly one week after President Barack Obama stood in the same room, addressing the same group of lawmakers, on the virtues of "compromise" in politics; Rauner used that word five times. "With my hand outstretched – with a genuine desire to compromise – with respect – I humbly ask you to join me in transforming our state for the better," he said. Yet Rauner glossed over some harsh political political realities. He was delayed coming into the chamber to give his speech by demonstrators lying down in his path. They were advocates were protesting on behalf of low-income students whose grants have gone unfunded, and homeless people who've been turned away from services. Their chants could be heard throughout the governor's speech. Rauner barely acknowledged their concerns; only saying that Illinois cannot afford to be compassionate until legislators adopt his agenda.